So this blog has been pretty dead, but I guess it is my own blog so might as well make a post. An archive of the adventures our guild took within FF14. We went into this game, Rho, Aaro, Cody/Rei Menu/10 billion other names, and myself looking to see what we could make of it. Rho wasn't fully convinced on FF14 and no idea what Cody wanted, but off on our adventure we went. 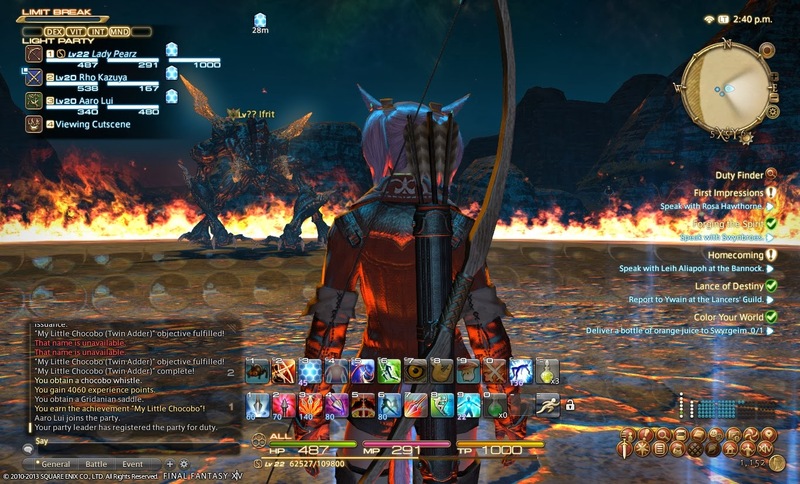 My personal main drive was Cody's constant complaint that I had "Big Fish, Small pond" Syndrome and I couldn't play these bigger MMOs because of it. I was out to prove it incorrect. As we progressed through our nub levels racing towards 50, it was Cody that reached it first. I was too busy with work and Rho and Aaro quickly took a liking to crafting and was busy crafting away. 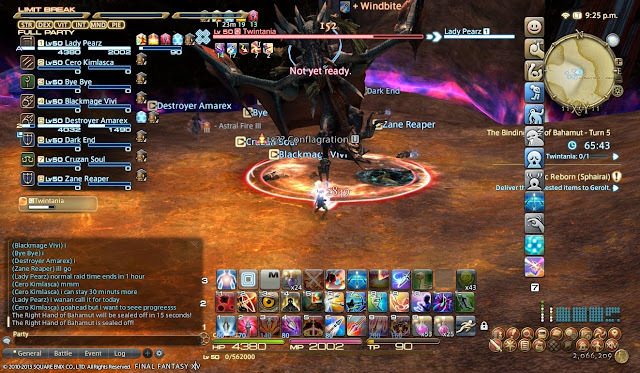 This was where for first split began, Cody decided he wanted to get his relic weapon asap and left off for the biggest FC on our server, ODAM, smashing his head on Chimera. I originally planned to never craft as I end up focus on merchanting in every game I play to become super rich, I wanted to divert that time and attention to progression. I guess you just can't take a merchanting soul out of a player. 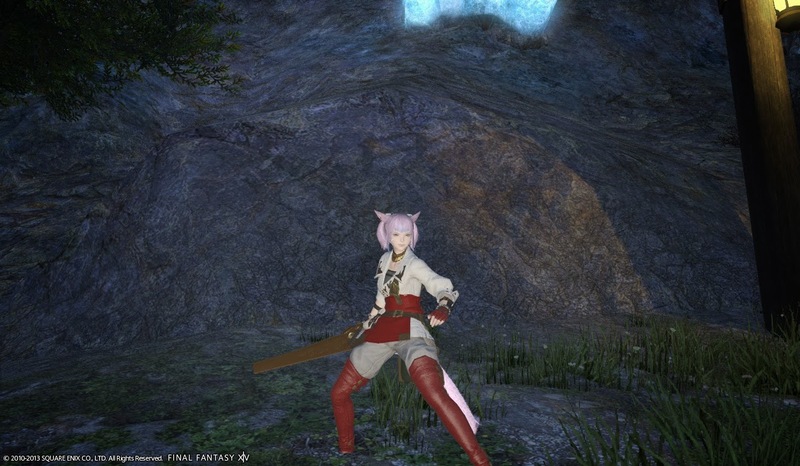 It started with carpentry as I wanted to craft my own relic weapon as Rho started with Blacksmith for the same reason. Quickly we realized how much money was to be made in this and we couldn't stop crafting. Meanwhile Cody was still working towards Relic weapon, I believe during this phase he was stuck on the first major roadblock, Titan. The next few weeks were followed with Rho and I mastering the rest of our crafts as we expanded our money as much as possible. 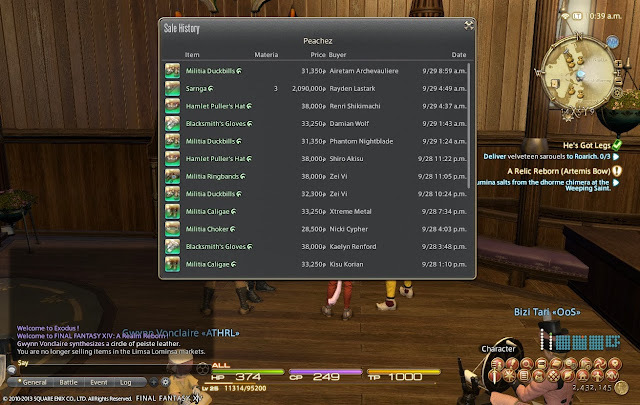 Crafting was fun because of the mass money we were just rolling around with. I was loved by many for selling everything for cheaper than everyone else and hated by all crafters (especially when I broke the Leatherworking cartel). 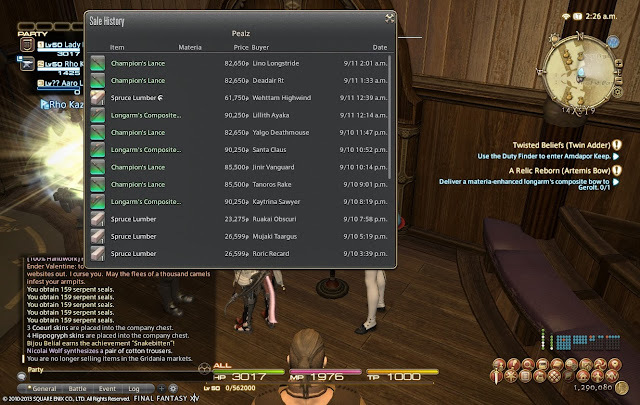 Then came the biggest push for gil ever, crafting the final end game items i70 gear. 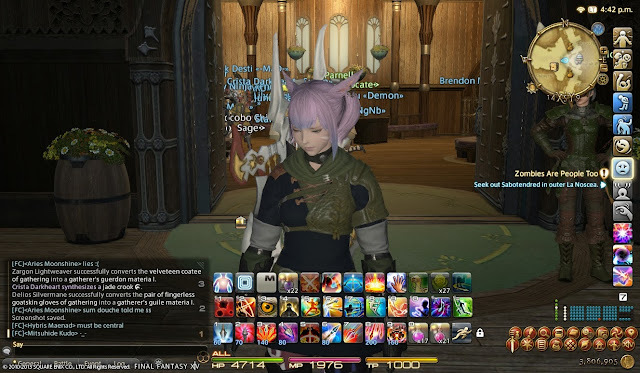 This where where Cody came back into the frey, being in the largest FC meant he could get us tome mats, items you had for farm from end game dungeons. While we were busy rafting, we couldn't run the dungeons ourselves needing us to buy these mats. 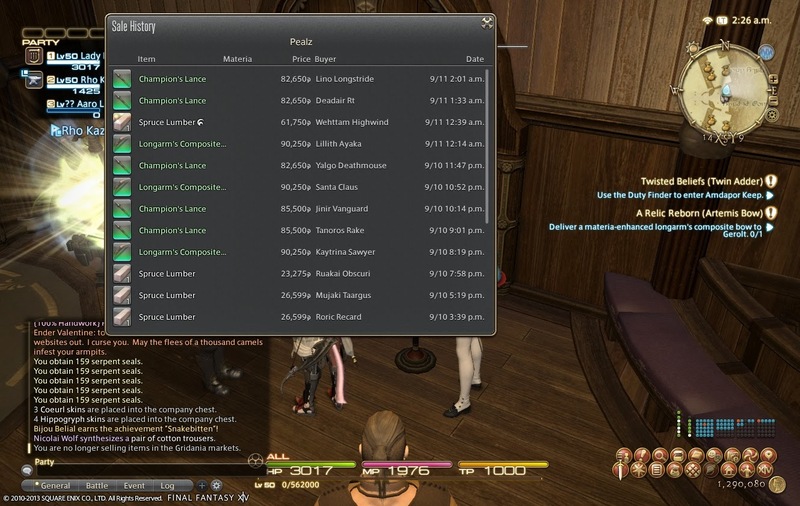 Us being the only crafters doing this, we were able to turn 270k into 2 mil, extreme amounts of gold at that time. We knew clear well that only gold buyers were affording our prices but we had the monopoly on our server, so we looked the other way. Everything was perfect, we had lots of money, fully geared ourselves and ready to finally try for end game content. This was when everything went downhill. Squeenix decided they wanted to get rid of gold sellers so they did a sweeping ban on everyone over a certain gil threshold. Obviously that applied to us raking in large money. Luckily I was just under the bar, but Rho was far richer and got hit by the ban wave. This would lead to the week long wait on the fate of Rho's character. A month into the game, all of us that had joined with the intention of playing together, but somehow our paths had all taken us in different directions, whether it be by choice or the fates of the devs. Roll another month and now I am the last man standing. As I reflect, I ended up getting what I wanted for better or worse. With Rho out of the picture, I was clearly top crafter on the server and most likely the most known player on the server. The final step left is to beat the so called unbeatable final boss of FF14 to hang up my bow.